The city of Beaune today retains its original late gothic architectural form, thus offering a detailed picture of the urban environment in which Ziem spent his childhood. Traditional multi-colored roof tiles, together with the sophisticated structural systems of French gothic design, created an animated and lively Burgundian architecture in the mid-fifteenth century when the city began rebuilding after the 100 Years War (1337-1453). One of the most important of the new building projects was the hospital/hospice sponsored by Nicolas Rolin, the chancellor to Philippe III, Duke of Burgundy (1396-1467). The Hôtel-Dieu (Hospices de Beaune) was remarkable not only for its colorful exterior, but more importantly, for its innovative interior plan, which prioritized patients’ privacy and dignity. In addition, Rolin commissioned the Flemish artist, Rogier van der Weyden (1399-1464), to paint a large polyptych altarpiece depicting the Last Judgement for the hospital chapel. This work introduced the extraordinary style of the Northern Renaissance to a city that might otherwise have remained unaware of it until a much later date. Having been surrounded by such sophisticated art and architecture as a child, it is not surprising that Félix began to study architecture at age thirteen.The family had moved to nearby Dijon in 1833 where his education with a local architect began in 1834. At the close of 1837, shortly after his mother’s death, the young Ziem was accepted at the Ecole des Beaux-Arts in Dijon, where he continued his architectural studies. There, he won a first prize for architectural composition in 1838, but then subsequently left without fully completing his program in May of the following year. At age eighteen, he joined his half-brother François in Marseille and found a job working as an apprentice to a local architect, Monsieur de Montricher. It was during this period that he began to perfect his skills as a draughtsman and a watercolorist. Working on the Canal de Marseille project, however, seems to have convinced Ziem that he was more interested in painting than architecture. In 1840, Ziem opened his own studio to students and began to establish himself within the arts community in Marseille. In particular, he became a close friend of the painter Gustave Ricard (1823-1873) who was also beginning his career during these years. Ziem’s primary student during this time was Auguste Aiguier (1821-1865), whom he taught to draw, subsequently recommending that Aiguier apply to the Ecole Municipale des Beaux-Arts in Marseille. [ii] The year 1840 also marked the beginning of Ziem’s ceaseless travels, which would become a way of life for him for decades to come. In May of 1840, he and Gustave Ricard left Marseille to journey through the Pyrenees. The two young artists spent a number of months on the road, returning to southern France only the following spring. It was at this time that Ziem first stopped in Martigues, a fishing port just a short distance northwest of Marseille; it is uniquely situated between the Mediterranean Sea to the southwest and a large inland saltwater lake to the northeast. The opportunities for scenic motifs are abundant. He returned to Marseille on December 18, 1841 to take up his teaching again, but within a couple of months, he moved on to Nice, 125 miles east of Marseille, where he taught a course in watercolor painting. The spring of 1842 found Ziem making his first trip to Italy, following the coast of the Riviera through Monaco and then on to Florence, Rome and Venice. Like generations of artists before him, Ziem studied the artistic traditions of the Italian peninsula, from the ancient Roman culture to the revolutionary developments of the Renaissance. On this trip he also was introduced to Venice, the city that would most consistently capture his attention for the rest of his life. After touring the Italian cities, he turned his attention northwards to Germany where he met the Prince and Princess Gagarin in Baden-Baden (they invited him to visit them in Russia); and by September, he arrived in Paris. During this brief stay in the French capital, he met a handful of artists, including Jules Dupré, Eugène Isabey and Eugène Ciceri, before returning to Marseille in early 1843. This pattern of traveling would remain typical of Ziem’s life for many years; he rarely stayed in one place for more than a few months. In September of 1843, Ziem traveled to Russia, journeying to St. Petersburg where he was presented at court as a “professor of watercolor painting” courtesy of Prince Grigory Grigorievich Gagarin, whom he had met earlier in Germany. The prince was a painter in his own right although his responsibilities as a member of the royal family required his participation in many other activities. Ziem stayed in St. Petersburg until September of 1844 before returning to France. He remained in the south of France for a record eighteen months, moving between Marseille, Martigues and Nice where he worked in the studio of the Austrian painter Arminius Mayer. Ziem’s nomadic years in the early 1840s facilitated the growth of his own aesthetic approach—and in some ways, he may have benefitted from his lack of exposure to Parisian artistic debates, nurturing his own ideas through exposure to a variety of landscapes and historical cultures. He had learned to draw as an architect, and he learned to paint from his direct observations of the world around him. He was one of the first painters, for example, to appreciate the beauty of the hills around L’Estaque, attempting to capture them on canvas in 1845 long before Paul Cézanne’s arrival in 1882. [iii] Ultimately, Ziem’s painting might be described as both contemporary and traditional. He worked directly from nature, preparing copious sketches and watercolors of the scene, but the actual canvases were always painted—and finished—in the studio. Throughout these early years of his career, Ziem earned a modest living by teaching drawing and watercolor lessons to local students, as well as by selling his landscape paintings of Italy to the cosmopolitan aristocracy of Nice. [iv] Whether from necessity or natural inclination, Ziem established effective business practices while still a young artist, keeping track of his sales and his paintings systematically. Ziem’s next adventure began in May of 1847 when he returned to Venice and then proceeded on to Constantinople (Istanbul) for six weeks. Fascinated with the exotic architecture and culture of the Ottoman capital, Ziem began painting scenes of the city that would later become a recurring theme in his oeuvre. His return journey took him across the northern marches of Italy with stops at Mantua, Parma and Genoa—eventually leading him back up the Italian coast to Marseille where he was reunited with his friends Ricard and Aiguier as well as his half-brother François. A month later, he was on the road again, this time to the southern Italian cities of Rome and Naples, and then on to the kingdom of Sicily. He wintered in Rome in 1847-48, and left in May for Venice and then Marseille and Nice. Perhaps a little weary of life on the road—or perhaps realizing that he needed to establish himself more definitively as an artist in France—Ziem moved to Paris in the fall of 1848 and leased a studio. Although he does not seem to have been particularly concerned about politics, his move to Paris in late 1848 coincided with the overthrow of the corrupt “citizen king” Louis Philippe and the establishment of the Second Republic. For artists, particularly the Barbizon painters and the Realists, this meant that the somewhat arbitrary restrictions mandated by previous conservative Salon juries were now loosened. Painters who had long been treated with disdain were welcomed and praised in official circles. Ziem gradually came to know these men and often sought out their company as he too worked in the forest of Fontainebleau. The generation of 1830 had much to teach the younger artist. As he settled into life in Paris, Ziem traveled somewhat less frequently. Throughout the 1850s, Paris was his home base. He exhibited regularly at the Salon, and worked consistently near Barbizon, sometimes for weeks at a time. Like other artists working on site, Ziem eventually acquired a studio-caravan so that he could live in Fontainebleau forest for as long as he liked. 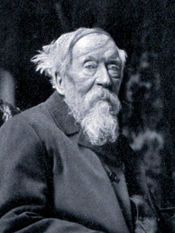 Increasingly, he worked alongside the other artists who gathered there: Jean-François Millet, Théodore Rousseau, Narcisse Diaz de la Peña and more surprisingly, Honoré Daumier. [vi] In July of 1853, he had sufficient income to purchase property on the rue Lepic in Montmartre where he made plans to build a studio. In spite of yet another political upheaval in 1852, when Napoleon III proclaimed himself emperor and established the Second Empire, Ziem’s financial success grew considerably during this decade. From 1850 to 1857, his annual income went from 3,713 francs to 40,570 francs—multiplying nearly tenfold in just seven years. [vii] Not only did this income allow him to purchase property in Paris, but it also enabled him to travel farther afield in search of fresh landscapes. In 1854, he spent July in Egypt; and in 1855, he embarked for Tunisia for two months in the spring. 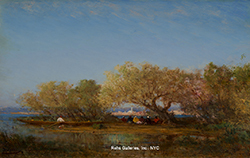 Later in the decade, he would venture to Algeria as well, traveling in the studio-caravan he utilized when working in Barbizon. The journeys to North Africa and the Middle East prompted a corresponding change in Ziem’s art; increasingly his subject matter would include images of mosques, camels and Byzantine architecture. The decade of the 1860s was a time of harmonious work and travel, exhibiting at the Salon and the 1867 Exposition universelle, and enjoying ever increasing success in the marketplace. In 1865, Ziem earned nearly 80,000 francs, a sum that he could only have dreamed of in earlier days. As art historian Léa Saint-Raymond explains in her article on Ziem’s financial history, the artist’s production during this time increased by about one-third and simultaneously, the average cost of his paintings rose from 1,160 francs to 2,572 francs. [xi] With additional resources at hand, Ziem again invested in property, this time purchasing the house previously owned by the painter Charles Jacque in the village of Barbizon. Like his home in Martigues, this was a place where Ziem could both live and paint in a setting that appealed to him. In addition, he expanded his studio space on the rue Lepic in Montmartre at the same time. In contrast, the 1870s opened with the Franco-Prussian War. Like many of his fellow artists, Ziem not only remained in Paris during the Prussian siege of the city, but also participated on the side of the Communards. In January of 1871, he was wounded in one of the attacks and his studio in Montmartre was destroyed. Fortunately, he was able to leave Paris for Barbizon where he spent the summer recuperating. The next several months were spent painting in Italy and the south of France. He returned to Barbizon in the summer of 1872, and in October, assisted in the burial of his friend Théophile Gautier in Paris. Several months later, in January 1873, Ziem’s close friend from his early days in Marseille, Gustave Ricard, also died in Paris. And in November of 1876, he was once again a pallbearer at the funeral of another friend and colleague, Narcisse Virgile Diaz de la Peña. The painters and writers who had been so influential on Ziem’s development—and so generous in mentoring him as a young artist—were gradually departing. Traveling between Paris and southern France, Ziem decided in 1876 to purchase yet another property, this time a villa in Nice known as the Baie des Anges (Bay of Angels). 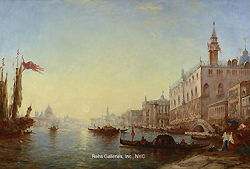 Over the next seven years, he would divide his time between Paris and Nice, with frequent voyages to Venice of course. Beginning in 1883, he included his hometown of Beaune on his itinerary for the next three years. It is not clear what prompted this change, but perhaps the painter had reconnected with some of his mother’s family in the region for business or legal reasons. The pattern of alternating between Paris and the Midi allowed Ziem to remain actively involved in the Paris art scene while also continuing to paint the seascapes that served him so well in his career. Until the end of the century, he exhibited at the Salon, worked with a number of galleries in Paris, London and New York, and increasingly dealt directly with private art patrons as well. And in 1900, he participated once again in the Exposition Universelle in Paris. In his late 70s, Ziem had begun to experience occasional illnesses. Although he doesn’t seem to have slowed down significantly, he did begin to make plans for his legacy. In 1904, he married Ursule Treilles, with whom he had shared a long-standing relationship. And in 1905, he donated a number of important paintings to the Musée des Beaux-Arts de la Ville de Paris. In 1908, the city of Martigues dedicated a room in City Hall to his paintings and two years later, the Musée de Ziem in Martigues was inaugurated on July 28. As Ziem entered his ninth decade, his health began to fail and he died on November 10, 1911 at age ninety. His funeral was held at Père Lachaise cemetery in Paris. [i] There is some debate about the origin of Ziem’s father Georges. The catalogue raisonné suggests that he was from Poland while Ziem himself apparently claimed that he was Armenian. Other sources have made a case for him being Croatian. See Anne Burdin-Hellebranth, editor, Félix Ziem, 1821-1911, vols. 1 and 2 (Brussels: L’imprimerie Futura, S.A.,1998) vol. I, xxi. [ii] Auguste Aiguier followed Ziem’s advice and eventually made his way to Paris to continue his studies. He had a modestly successful career, exhibiting at both international expositions of 1955 and 1862 before succumbing to tuberculosis in 1865. His work focused primarily on Romantic marine paintings of large sailing ships. See the exhibition catalogue by Jean-Roger Soubiran, André Alauzen et al, La peinture en Provence dans les collections du musée de Toulon du XVIIe au début du XXe siècle (Toulon, France: Musée de Toulon, 1985). [iii] See Sophie Biass-Fabiani’s essay “Félix Ziem, peintre de Martiques ou peintre à Martigues?” in the catalogue raisonné, Félix Ziem, 1821-1911, vol. 1 (Brussels: L’imprimerie Futura, S.A.,1998) xiii-xvi. [iv] Félix Ziem, Journal (1854-1898), eds. Sophia Biass-Fabiania et Gérard Fabre (Arles, France: 1994) 145. [v] Léa Saint-Raymond has analyzed Ziem’s account book and his business practices in abundant detail, providing a comprehensive examination of Ziem’s financial status, and illuminating the business practices of nineteenth century art dealers and collectors. See Léa Saint-Raymond, “How to Get Rich as an Artist: The Case of Félix Ziem—Evidence from His Account Book from 1850 through 1883” Nineteenth-Century Art Worldwide 15, no. 1 (Spring 2006) 98. See http://www.19thc-artworldwide.org/spring16/saint-raymond-on-how-to-get-rich-as-an-artist-felix-ziem. [vi] Félix Ziem, 1821-1911, vol. 1. Catalogue raisonné, xxii. [vii] Saint-Raymond, “How to Get Rich as an Artist: The Case of Félix Ziem—Evidence from His Account Book from 1850 through 1883”, 98-99. [ix] Félix Ziem, Journal (1854-1898), eds. Sophia Biass-Fabiania et Gérard Fabre (Arles, France: 1994) 35. [x] Quoted in Biass-Fabiani, “Félix Ziem, peintre de Martiques ou peintre à Martigues?” in Félix Ziem, 1821-1911, vol. 1, xiii. Translated by the author. [xi] Saint-Raymond, “How to Get Rich as an Artist: The Case of Félix Ziem—Evidence from His Account Book from 1850 through 1883”, 93-94.